But, after pressure from Europe’s farming lobby, MEPs gave an exemption to enteric methane. 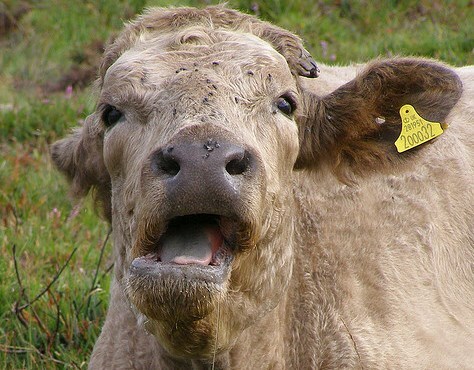 Enteric methane is mostly caused by animals like cows burping. It represents a “significant share of methane emissions” from agriculture, according to the European Environmental Bureau (EEB). It was not covered by the European Commission’s proposal in any case, EURACTIV was told by Parliament sources. Methane is a more short-lived but much more powerful global-warming greenhouse gas than carbon dioxide. It also transforms into ozone, an air pollutant. Ammonia causes soil nitrification and acidification, and transforms naturally to become fine particles harmful to human health. Agriculture, which has a notoriously powerful lobby and is heavily subsidised by the EU, is responsible for 40% of methane emissions in the EU and 95% of ammonia pollution, according to the EEB. MEPs were voting in Strasbourg on a report by the Parliament’s Environment Committee on the revised National Emission Ceilings (NEC) Directive, which limits different types of air pollution in each EU nation. Air pollution is responsible for the deaths of 400,000 citizens a year. The bill caps six major pollutants – nitrogen oxides (NOX), particular matter (PM2.5), sulphur dioxide (SO2), methane (CH4), ammonia (NH3) and non-methane volatile organic compounds. The Environment Committee had strengthened targets in the European Commission’s original proposal. It is the first time the Commission has tried to cap methane. The executive is pushing for a 30% methane reduction by 2030, which was backed by the Environment Committee, and a 27% ammonia cut, which MEPs increased to 29%. But amendments passed by the Parliament today mean that the 29% was watered back down to 27%. The ammonia target was opposed by some MEPs, notably the European People’s Party. The EPP, the largest group in the Parliament branded the cap as unrealistically tough. Methane emissions would be covered by separate EU legislation to cut greenhouse gas emissions, they said during the debate. MEPs voted to include ammonia and methane and for binding 2025 targets to ensure countries were on track for 2030 goals. The Parliament’s Agriculture Committee had called for the methane and ammonia targets to be dropped from the legislation before the vote.Despite that, the Environment Committee report on the NEC Directive was narrowly passed by the committee ahead of today’s vote. 38 voted in favour, 28 against, and two abstained. Before today’s vote, Copa-Cogeca, a Brussels-based lobby association representing European farmers and agri-cooperatives, emailed MEPs. It warned that production would be shifted outside of the EU, if stronger targets backed by the Environment Committee became law. Vella said there was absolutely no need to alter the structure or reduce the number of animals to hit the targets in the Commission proposal. He poured cold water on claims by some MEPs that methane cuts would force animals to be kept inside, to the detriment of their welfare. Governments such as the UK had also told MEPs they were against the bolstered bill. Before the bill can become law, an identical text must be agreed by the Parliament with the Council of Ministers. British MEP Julie Girling (Conservatives), the lead lawmaker on the bill, voted against her own report after a coalition of left and liberal MEPs pushed for the stronger targets. Girling, a member of the European Conservatives and Reformist group, argued that the stronger targets would derail negotiations with the Council of Ministers. Before today’s vote, she urged lawmakers to “vote responsibly” by not supporting lower ceilings and supporting the ammonia amendments. She also called for financial help for farmers, a scientific review of ammonia by 2020, and financial help for farmers in the mid-term review of the Common Agricultural Policy greening initiative. >>Read: Special Report: Can the (new) CAP deliver on sustainability? “Think very carefully, we don’t have a position from the Council. Let’s not signal intransigence, let’s not indulge in grandstanding, let’s not play to the gallery,” she said. The Council and Parliament were seen as so opposed over the bill that the NEC Directive narrowly missed being axed as part of the Commission’s drive for ‘better regulation’. But Matthias Groote (SPD), warned against weakening the targets. EPP member Peter Liese (CDU), of Germany, said, “We see a danger that because of the [Environment Committee] amendments, we will achieve nothing. Liese said MEPs should base their position on the Commission’s original legislative proposal. Catherine Bearder (Liberal Democrats), said that more people die from poor air quality than from smoking. Labour’s Seb Dance said the figure was closer to 700,000. Over a decade that was seven million deaths, the same as the population of Bulgaria, he added. “For the first time we are addressing agriculture and immediately there’s a main lobby out there saying ‘not agriculture’. Every sector needs to contribute,” said Bas Eickhout, a Dutch green. He said removing methane from the bill would “weaken the prospects of an ambitious” UN Climate Change Conference. World leaders will meet in Paris on 30 November in an effort to limit global warming to two degrees above pre-industrial levels. “If the EU wants to be credible at Paris, we need to reduce methane emissions,” said Estefania Torres Matrinez (Gue/NGL), of Spain’s Podemos. But UKIP’s Roger Helmer (EFDD) had a different view. He supported ceilings for sulphur oxide and nitrogen oxide emissions “because unlike carbon dioxide, they are genuine emissions that damage health. Olaf Stuger (Partij voor de Vrijheid), a Dutch member of the Europe of Nations and Freedom group, questioned the entire basis of the bill. He said that Commission figures were never credible. Trusting Commission figures he said, was like trusting Zimbabwean President Robert Mugabe to monitor the stock of elephants. Liberal Democrat MEP Catherine Bearder said, "Air pollution causes ten times more deaths each year than traffic accidents, yet we are still not doing enough to tackle this invisible killer. These ambitious pollution limits will ensure that every sector, from industry to agriculture, plays it part in cleaning up Europe's air. "The long-term benefits of improving air quality will far outweigh the short-term costs." Alan Andrews, clean air lawyer for ClientEarth, said: “This is a missed opportunity. Thousands of people will die or suffer debilitating illnesses like heart disease, asthma attacks and strokes because the parliament failed to adopt stricter pollution limits. “The British Government’s fingerprints are all over this. They have been acting as a mouthpiece for farming instead of working to protect our health from air pollution. “We are happy that MEPs have put citizens’ interests and wishes first and not given in to vested interests, particularly to pressure from farmers and agribusiness,” said Anne Stauffer, HEAL deputy director, “even though we would like to have seen a higher ambition”. Judging by the catchy title, and the poor ‘reality check’ control, you are becoming my second best smug, after ‘the sun’.